"Justin Theroux Hints He Shaved Beard For Jen Aniston"
According to US Weekly (yeah, I read US Weekly, what's it to ya? 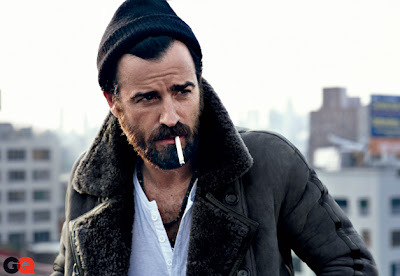 ), Justin Theroux shaved off this most excellent beard for his new girlfriend, Jennifer Aniston. This article states that Theroux was "proud" of his "full, hipster-friendly beard he sported until early summer." However, during an interview with GQ magazine, he admitted "Certain chicks dig it; certain chicks don't." He shaved his beard shortly after they finished shooting the movie Wanderlust (and after he hooked up with Miss Jen). All I have to say is.....that beeyotch! Happy Beardy Friday To All! Odd confession: I like beards but not the lip part. So my hubby wears his sans the lip part. It actually really looks good on him like that. As for Justin, that's a shame. 'Cause without the beard he comes off to me as a prick. With the beard he looks all cute and stuff. Juju...what a great hubby you have! Justin looks like a nice teddy bear with the beard...without it, he looks like every other Hollywood schmo. Meh. Ladies, get your pitchforks! That beyotch is going DOWN for this travesty! Spaz....I hear ya! At least he can grow it back when he comes to his senses! Oh that relationship isn't going to last! How dare she! I love the scruff look. He is way more attractive and manly with a beard. Oooh! Today I saw a guy biking with an auburn beard down to mid-chest. It split in half in the wind and blew over his shoulders! You would have loved it! Julia....that sounds like a momentous beard!